Still a chance to wrap it up? 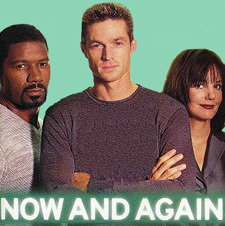 Now And Again is an action-comedy-drama-romance-science fiction. A subway train accident leaves Michael Wiseman with a brain and no body. The government, by way of Dr. Theodore Morris (Dennis Haysbert) gives him the option of having his brain transfered into a super-human body (Eric Close). But, the catch is that he can never see his wife, Lisa (Margaret Colin) his daughter, Heather (Heather Matarazzo), and his best friend, Roger (Gerrit Graham) ever again. To contact them would mean their deaths and maybe even Michael's. Disclaimer: Now and Again characters, settings, etc. are a property of Glenn Gordon Caron, CBS, Picturemaker Productions and any one else. I'm just paying homage!! No copyright infringement is intended.